The program allows you to search files on network computers' and servers' shares (including hidden administrative disk shares C$, D$, E$, ... using the SMB/NetBios protocol) and FTP servers. This software is a good choice for the network administrator or user willing to know where necessary files are located on the network. The program is easy-to-use but powerful and advanced at the same time. You can preview and download found files, or save the list of files to a report. The Pro version offers the automatic repeated searching and the automatic file deletion with logging. For network users: Find necessary files on your local network's servers and workstations! Search for documents or specific text in them on your corporate file server. Search for photos or media files on your collegues' PCs and watch or play them right in the program! For network administrators: Search files on servers and users' computers including hidden and administrative shares (the c$, d$, e$, ... disk shares). Find and delete unnecessary, temporary, or malicious files on remote computers. 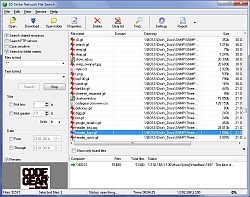 Find all video and other media files that your users store on servers hogging up disk space. For security officers: Search for specific phrases in documents stored on public shares and servers on your network. Find confidential or private files and report or delete them. The Pro version of the program allows you to monitor files periodically in the background mode. It searches for documents and specific text strings in them, logs all the found files, and can even delete them automatically if necessary. Search documents by content. Search files in hidden shares (including the admin shares c$, d$, e$, etc.) on user's workstations. Find malicious files or any data you need on the network! 10-Strike Network File Search looks up network computers on Microsoft Windows Network and can scan sets of IP addresses or IP address ranges. Enter file masks and a search phrase (optionally) and find the information you need. View the search results and open found files directly from the remote computers or copy them to your hard drive. Generate and save handy reports on the search results. The program scans shared resources using the multithreading technology; this helps cutting the search time significantly. What other programs search files for an hour, our program finds them in a few minutes! 10-Strike Network File Search Pro ($99.95) is more advanced version of the program, which contains a built-in web server. With its help you are able to install the software on a single computer, so users and administrators are able to search files on your local network using a regular web form, without installing any software. The Pro version also allows you to run repeated searches automatically, log or delete the found files on network computers. 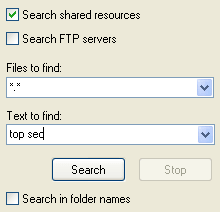 Search for files on FTP servers. Delete files on network computers. Configure the domain, computer, resource, and folder filters (where not to search) for saving your time even more. Export search results to TXT and HTML reports. Buy a license and get free upgrades and priority e-mail support.